Just how low will the financial manipulators crash Bitcoin after pushing it to $20,000? Screenshot taken at 10:10 AM EST on Friday, December 22 when Bitcoin went as low as $11,465. Make no mistake about it, the engineered and ongoing crash of the cryptocurrency Bitcoin was deliberately timed to begin in earnest just before the Christmas holiday. And it has all gone down so soon after Bitcoin hit a record high of $20,000 on December 17th when the perps artificially inflated its price via high-frequency trading, futures manipulation, and other financial engineering tricks. Is the BITCOIN bubble bursting in real time? The financial manipulators who planned this unparalleled crypto-collapse did so with great stealth and coordination. Who else could have driven the price of Bitcoin into the crypto-market stratosphere so quickly but the international banking syndicate headed by Goldman Sachs? Who is really behind this controlled demolition? Everyone ought to know the answer to this question by now: the B A N K S T E R S.
Just as Goldman was the chief financial engineer behind the controlled demolition of the stock market during the Fall of 2008, the same banksters are now demolishing Bitcoin. It ought to be quite obvious to those folks who did not mortgage their homes to join the Bitcoin rush of 2017 that this pre-holiday demolition was executed with purposeful design. While so many travel to and fro during this holiday season when drivers, fliers and train passengers are already frazzled and frayed by both the Atlanta Airport power outage and Amtrak train derailment onto Washington State’s Interstate 5, distraction and anxiety about traveling is at an all-time high this year. Why was an Israeli cargo plane the only one permitted to depart Atlanta during the power outage? Were these distractions deliberately fabricated during the exact time frame when Bitcoin began its precipitous descent? And were they also meticulously timed to occur between the hectic period between Thanksgiving and Christmas? This is exactly how and when the banksters perpetrate their biggest heists—using distraction, diversion and misdirection. They have complete control of the USA and can stage any hoax or false flag operation or terrorist attack when and where they so choose to. Hence, the true cause and timing of every major event during December must be carefully considered in order to correctly comprehend this complex financial black operation. Any rapidly evolving psyop as multifaceted and captivating as the Bitcoin rip-off is assured to have profound and far-reaching repercussions. What’s the point of this massive controlled demolition? • After conning investors to move their hard-earned money from gold and silver metals into cryptocurrencies, the banksters can wipe out that investment capital for good so that it is no longer available to support the price of gold. • Such a meteoric and devastating crash of Bitcoin will fully convince the legislators that the time is way past due to impose a strict regulatory regime on all cryptos, not just Bitcoin. In this way, the banksters will effectively control them all–forever. • The tremendous degree of conversion of U.S. dollars into Bitcoin is serving to remove a prodigious volume of inflationary petrodollars from the global marketplace. The more Bitcoin buying that occurs on dollar-denominated exchanges, the more US dollars will be eliminated that were produced during the successive cycles of quantitative easing. • The most significant reason for the supernova explosion of Bitcoin and other cryptos is the normalization of cryptocurrencies. Only in this fashion will they become sufficiently acceptable to people everywhere, whereupon a global digital currency can be established before it’s imposed worldwide via manufactured consent. 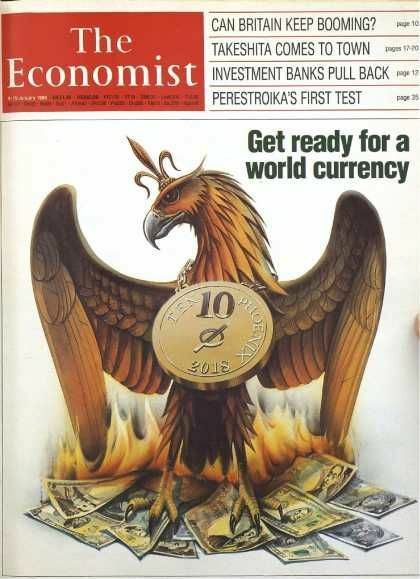 Even The Economist magazine predicted the introduction of a “world currency” in 2018. That Bitcoin will eventually go all the way to $0.00 is practically guaranteed in light of the fact that there’s NO underlying value whatsoever to the cryptocurrency. After all, isn’t that why it’s called a C Y R P T O C U R R E N C Y ? ! One thing is for sure in the course of this unfolding scam: there will be more than one major sucker’s rally before Bitcoin crashes and burns for good. And it looks like the perps may be setting up the next round of suckers at this very moment. Is Bitcoin a real planet killer?